Hello, I don't suppose anyone could tell me how I would go about recreating a material to pulse like how I have done in this blender animation? More soo focused on the white stripped lighting instead of the circles. I guess no one is going to help me out. Cheers. (In this case, the first MatInstance had 0.5, the second had 0.3, and the third had 0.1) And apply the right material instance on each line-mesh to get the result you want. 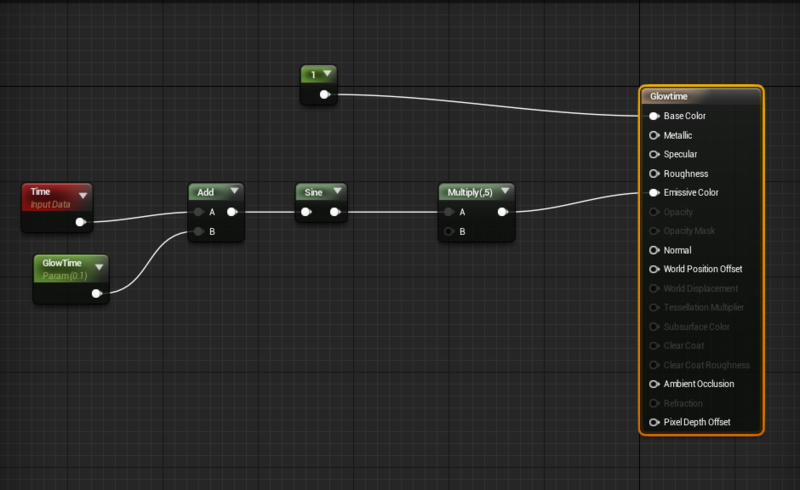 If you want more control on the speed, you can put a multiply between the time and add node. this way you can slow down and speed up the pulse. Sorry!! I get a smidge inpatient when working on something and desperate to find a solution. Thanks you very very much Luos. Hey Luos . . I have stumbled across a similar problem. . but i want it on a single mesh pulsing either from top to bottom or from left to right . .
How did you get the 'thing' called GLOW TIME?? I put a Constant there (Only way i know to make a 'number')??? But changing it doesn't really seem to make the blinking change much???? Glowtime is just a scalar variable. Hold down "s" on the keyboard and left mouseclick. (in the material editor) this will give you a variable scalar you can name yourself. e.g. glowtime. I was just trying to solve this problem myself, and I think I might have found a great solution that is very flexible. I can also alter the speed, depth, and color of the pulse using a Vector Parameter and two scalar parameters. I can make the lights flicker or slowly pulse, and even remain black for a period of time. Hopefully this image is all self explanatory. Good evening and thank you for the quick and easy solution. I have replicated this method this afternoon with success. However the project crashed and the material was apparently ghosted (there in the preview, but the file nowhere to be seen later). And when I have tried to replicate it again, the Time node seems to be doing some really, really weird sh*t... Such as dipping under 0. Any clue on what could have happend?